Southern California’s Lower Kern River, which offers-up some of the best whitewater rafting in the west, has been flowing at a perfect level for over a month and continues to release great rafting flows from Lake Isabella. Lake Isabella is the dividing feature between the Kern River’s Upper and Lower stretches. 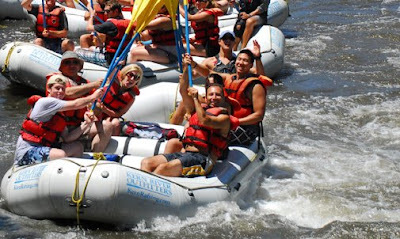 The Lower Kern River is well known for exhilarating rapids ranging from Class II to Class IV, warm water, and a spectacular canyon that twists and turns on its way downstream. Most two-day rafting trips launch near the town of Lake Isabella and rafters are treated to a few warm-up rapids before dropping into the more serious Class III and IV drops. Teamwork is a key ingredient for success on the Lower Kern River’s rapids! At our camp, which is approximately half-way through the stretch, visitors are treated to spectacular meals prepared by our guides… or should we say chefs? We are the only outfitter that has sleeping decks and thick sleeping pads (commonly referred to as “Paco Pads” – the industry leader in outdoor sleeping pads) for our guest’s comfort. 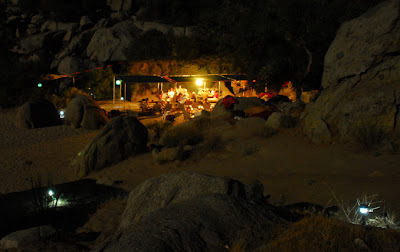 As night falls on the Lower Kern River canyon, our camp comes to life! The second day of the two-day Lower Kern rafting trip starts with a delicious breakfast and then it’s back to the rafts for more Lower Kern whitewater. After five miles of class III and IV rapids, we pull over for lunch to enjoy yet another tasty river-side meal. Upon reaching take-out at Democrat, you’ll be thoroughly soaked (and maybe a little tired). Whitewater, sun, and the fact that you don’t have to worry about logistics, meals… or anything. What could make this trip better? We’ll be running the Lower Kern through mid-August and would love to prove to you how wonderful an experience it is. Call us at 1-800-323-4234 to begin planning the most excellent of summer get-aways!